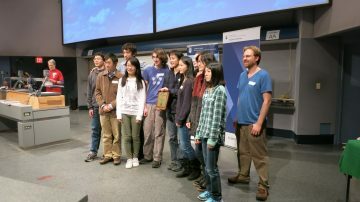 Point Grey 2014 Physics Olympics Team with their physics teacher – Mr. S. Schmitt. 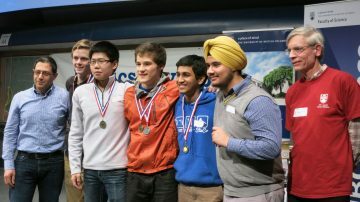 While we realize that our web site has a lot of information, sometimes it is important to hear from peers – how Physics Olympics preparation is happening in other schools. Below, we will describe some of the strategies that physics educators across BC shared with us with the hope that these strategies will be helpful to other physics teachers and coaches. We are also starting UBC Physics Olympics Mentorship Circle. If you would like to be a part of the UBC Physics Olympics Mentorship Circle (as a mentor or a mentee), please email Marina Milner-Bolotin: marina.milner-bolotin@ubc.ca . Semiahmoo Secondary School 2014 Physics Team with their physics teacher – Mr. L. El Halabi (left) and UBC Physics Professor Ian Affleck (right). Try to come to a consensus rather than majority rules. I also was only teaching Physics 12 in the spring and had very few students who took Physics 12 in the first semester who were involved. Consequently, most of my students lacked an understanding of the concepts of the entire Physics 12 curriculum when the Physics Olympics took place in the early spring. However, I was fortunate to have many very good students in my two classes. I was busy assisting part-time with an after school sport, so I was only able to arrange one group meeting each week which I could attend. However, I set up a OneNote notebook for the Physics Olympics group to use as a “reference & discussion” site they could all access at home any time through Office 365 (available for the entire district student population). I provided some initial reference material (Fermi Questions link, past Physics Olympics events etc.). I’d meet with them once a week, but I found that most students had very busy schedules and could not all meet at one time. Only the Vinegar Baking Soda Ballistics group met regularly in the Chemistry lab to test their ideas. Overall, the students enjoyed themselves, but they weren’t as successful as I thought they might be. I had done very few lab activities in class and the students were not familiar with the concepts involved in the lab events and there were some group dynamics issues, but it was a valuable learning experience for them. I could have also had the group from the previous year do a simple report on preparing for and participating in their events, which might have helped the “new” group this past year. The inclusion of a few interested grade 11 students has provided some carry-over experience for next year. Also, including a weekly Fermi Question or Quizzics (Kahoot style) session might help prepare the Physics Olympics participants and create interest and fun in the classroom. (I haven’t done anything like this yet, but I hope to try it soon). 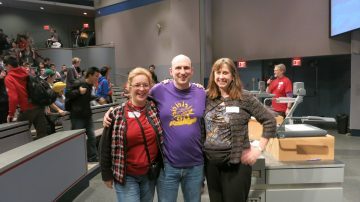 Our school has had a good science club over the last 10 years, and another teacher has sponsored/ coached a team in the annual Kwantlen competition. This helped to get some students out for Physics Olympics because of the positive experience they had with that competition. UBC Physics Olympics Organizers Drs. Milner-Bolotin (left) and Janis McKenna (right) congratulate an award winning physics teacher – Mr. Bruce Gowe whose school, Penticton Secondary, once again won the event (2014). 2. I try to encourage students to go by telling them how much fun it is, how interesting it is to see UBC, and how challenging the competition is. I also always try to have some grade 11 representation so that each year there are kids who can say “last year we did…” I make students entirely responsible for organizing their communication methods, meeting times, topic “specialization”, and travel arrangements. Of course, time-management is the most essential teacher-coaching topic! I have a set of tools etc. dedicated to the pre-build competitions, and I get $200 of PAC money every year to pay the registration and materials costs. If there is extra, I buy the kids lunch at UBC. If some kids can’t get in to the closed events, I try to get them touring around to see the sights. We take lots of pictures and give them to the office staff for the school newsletter and to the yearbook people as well. 3. One effective way to get students to prepare for the UBC Physics Olympics is make the pre-build events inquiry-based assignments for your Physics 11 and Physics 12. It is completely within the spirit of the new curriculum and gives value to the preparation stage. Without this (or similar tactics), the students will start working on a solution about 10-12 hours before the event begins, and their designs will almost certainly be terrible. The caveat is that the rules need to come out early enough for there to be time to engage. I have no advice for the other events, other than explaining/practicing log-scales for the Fermi. Our results have been so hit and miss, it really does seem down to the students rather than any regime I have put in place. The results of this study also offer support for specific recommendations to be made for competitive learning environments such as these so that they can most closely resemble the structure and dynamics of a complex system. The system should be as decentralized as possible. Participation must not be mandatory or have defined or prescribed roles. It is important to allow students’ roles within the team to emerge depending on their diversity of interests and perceived strengths and weaknesses. Positive feedback loops help to push a complex system away from equilibrium so that emergence is more likely to occur. The activities should be rule-bounded but flexible. Some parameters should be set and students work within them to explore the large array of possible solutions. Feedback from their successes and failures evoke emotions and motivate engagement. Neighbor interactions help the dynamics of the system to move towards emergence. Do not isolate the team in preparation or competition. Providing an open space where students and teachers interact around their projects can promote self-organization, neighbor interactions and opportunities for students’ ideas to bump against one another. Moll, R.F. (2011). Affective learning in playful learning environments: Physics outreach challenges. Children, Youth and Environments, 21(2), 256-270. If you would like to be a part of the UBC Physics Olympics Mentorship Circle (as a mentor or a mentee), please email Marina Milner-Bolotin: marina.milner-bolotin@ubc.ca.